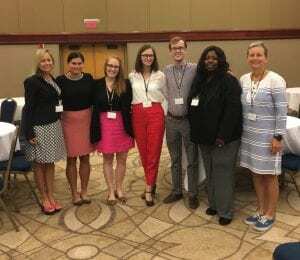 MPA Blog at the University of Charleston, S.C.
Last month, members of our Master of Public Administration program attended and presented at the 2018 Southeastern Conference of Public Administration (SECoPA) in Birmingham, Alabama. SECoPA is an annual gathering of researchers, practitioners, and students who share innovative ideas, engage in scholarly discussion, and network with the public service community. Four members of our program presented in the following panel discussions: Dr. Chaffin-DeHaan, Women in Public Administration; Nick Mercer, Service Learning in Public Administration Classroom; Danielle Bloom, Criminal Justice Issues; and Macy Adams, Nonprofits in Action. #GENDERGAP: How Would MLK Respond to Wage Discrimination across the Public, Private and Nonprofit Sectors? Despite the passage of the Civil Rights Act of 1964 which Dr. King Jr. advocated for prior to the inception of his Poor People’s Campaign, the social acceptance and implementation of anti-discrimination laws in the United States has been slow. Through a national survey, this study examines the prevalence of wage discrimination experienced by women in the United States by sector (public, private and nonprofit) and by industry. With rising levels of inequality and poverty in the U.S. there has been a revitalization of MLK’s Poor People’s Campaign, 50 years later. A few of the questions I seek to address are, how prevalent is wage discrimination across the sectors and what explains the variation? How would Dr. King Jr. address the pervasiveness of wage discrimination that still exists? The results of the study indicate that wage discrimination is less likely in the public sector and that while younger women and minority women reported higher levels of wage discrimination, so did married women emphasizing that wage discrimination in the workplace is a family issue and not solely a women’s issue. At SECoPA, I had the opportunity to present about how my graduate assistantship with the Community Assistance Program (CAP) is a model of experiential learning that enhances the community. The CAP is a learning incubator held within the MPA program here at the College. Individual organizations and municipalities approach the CAP for capacity building support,and graduate assistants work with the nonprofit in a consultant role. Working with the CAP allows me to gain hands-on experience with what I am learning in class while providing an otherwise inaccessible service to the community. I am grateful for the chance to have attended SECoPA where I learned from key practitioners and academics in public administration. It was exciting to hear about research related to a diverse array of topics including emotional labor, reentry programs for people returning from incarceration, the utilization of employee assistance programs in state university systems, and others. Even more exciting was the chance to add my own research and experience to the field. At SECoPA, I had the opportunity to present an academic paper, co-authored by Dr. Latasha Chaffin-DeHaan and Dr. Kendra Stewart, titled “How Prisoner Reentry Programs Influence Reentering Citizens’ Trust in Government”. The research sought to explore how a nonprofit reentry (of individuals released from jail or prison) program in Charleston helped recover participants’ trust in different levels of government, up to 34% on the state level. An increased sense of governmental trust was most evident between the groups of participants who were in the second phase of the program and were employed through the program in governmental positions. The paper explains the implications of how reentry programs that are non-paternalistic (giving participants equal opportunity to benefit) and allow for government participation can help recover some of that government distrust among the reentering population. Nonprofit Evolution in Action: What if the Community Foundation Did Not Look Like a Community Foundation? This summer I was privileged to work with a community foundation in central Wisconsin on organizational development and values-based decision making. This foundation serves a rural region that is recovering from a economic slump. The main industry in the region experienced large-scale job cuts in the late 90’s early 2000’s that left over 40% of its residents unemployed. The community foundation has been undergoing a perpetual transformation ever since in order to meet the ever-changing needs of its population. A large-scale organizational change requires a lot of work on the part of the board, staff and stakeholders. My work there consisted of training staff in how to make values-based decisions and how to rethink the concept of individual and organizational leadership. Additionally, I assisted the board in retooling their mission statement, as well as planning for the succession of their CEO; a woman who has held the position and led the foundation’s vision for over twenty years. Over the three months I spent in Wisconsin, I learned the importance of cultivating culture in a nonprofit setting, and how cultivating and reinforcing positive behavior in staff can make or break an organization in times of change and innovation. 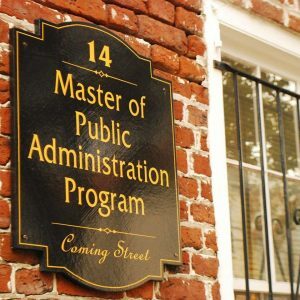 The column for and by public service agents and students, based at the globally-accredited MPA Program at the College of Charleston.